The consumers of Nayatel use unlimited data for above mentioned services at 30 mbps speed at flat monthly rate. 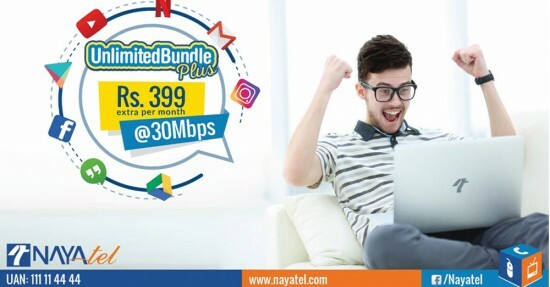 Nayatel has introduced 10 mbps unlimited bundle for Rs.200 per month in April 2017 and there is enough uptake and popularity for which the company has upgraded bundle with more services and higher speeds. Charges: The charges are applicable as Rs.399/- month with the government taxes.